Gladly our angling in April was a big improvement on the previous two months with 37 fish landed in total. The month started as March had finished with extremely hard, dry and cold weather. There was beautiful sunshine during the day and then bitterly cold at night with grass minimums as low as -7.9 degrees C.
We did have a few anglers who kept plugging away in week 14 and were duly rewarded for their efforts. Peter Morrison managed to take a fish of 8lbs3ozs from the Holly pool with the water level at 5. Joe Burke and Doug Keating both managed fish off Finlough in difficult conditions. Credit has to be given to all anglers in week 15 who tried hard, despite the river being below 0 and temperatures still bitterly cold. We failed to land any fish for the week but it wasn’t for the want of trying. Towards the end of the week the weather finally broke and we ended up having plenty of water for the rest of the month. The water made all the difference as fish started to run and we landed 14 for week 16. With the increase in temperatures Finlough proved successful with 8 landed, 4 from the river and 2 from Doolough. Successful anglers were Rob Fanshawe, Guy Hollis, David Dunne, Bob Hadden, David Parry, Michael Roden, Michael Wymes and Paul Wymes. For the remaining few days in April we landed another 4 fish. As temperatures got colder again all 4 were taken off the river, with the lakes once again proving difficult. Successful anglers were Urs, Geoff Lucas and Fredo Dietrich. That brought total for the month to 37 which is one ahead of the 10 year average. Hopefully this trend will continue into the month of May. 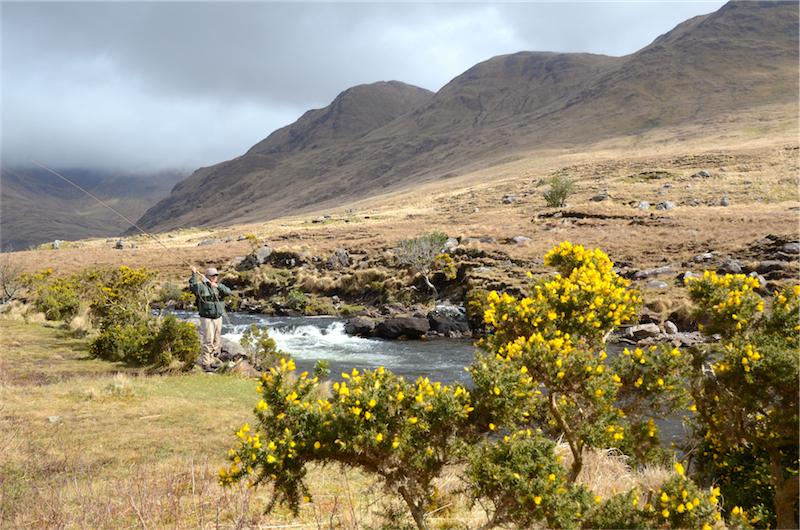 If you want to check out some of the excellent salmon fishing experienced by our anglers in April view Delphi’s You Tube video “In Pursuit of Silver” on our website.